I was on vacation last week and now it is back to business as usual. I took a couple day trips and also went to Seattle for a few days. I had never been to the city of Seattle and it was nice to see it. I feel way more familiar with it now since I drove around and around so very much. I went to the Space Needle and was very pleased to be right in the front, my face pressed against the glass of the glass elevator as we went up 520 feet. I love glass elevators. I also went to the Science Fiction Museum which was very cool. 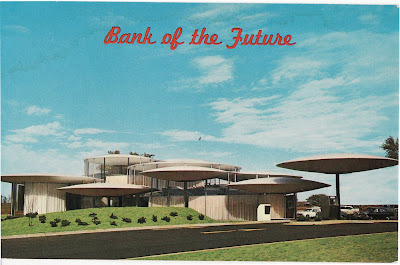 So, in honor of these futuristic things I wanted to show you one of my favorite futuristic postcards. This beautiful and unusual modernistic designed bank, located at 3900 No. Lincoln Boulevard, is called the "Bank of the Future". It is equipped with a floating air lobby from the main floor and a cashier to customer TV drive-in banking window. It looks like the bank still exists. Here is another blogger who found the postcard and took a little road trip to see it. Awesome.